Personalize a bottle of Berry Breeze with your own handwritten message on the label! It's the perfect way to add an extra unique touch while saying "Happy Mother's Day", "Thank You", "I Love You", or whatever message you want to say to the special people in your life! 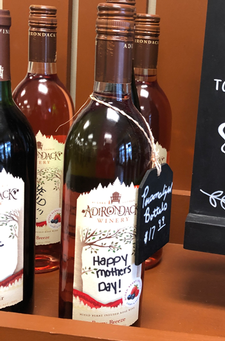 On a beautiful label featuring a border of trees, you can choose to leave the label blank to write yourself, OR just tell us the message and we can handwrite it for you! Black sharpie is typically used to handwrite messages. Price indicated above includes special label & handwritten personalization. This wine is available for both Shipping & Pickup orders! Pickup at any of our 3 locations.